The Big Year…those three simple words than can elicit so many different emotions from Birders around the world. For some, the purity of birding should be without hype, without competition. Sitting in a city park, or quiet hide somewhere, enjoying nature and all the serenity it has to offer. Of course, the “numbers” people are all about the competition, and how many bird species can you find in a year. For me, the very premise of a “Big Year” got itself rooted in the back of my brain after watching a historic comedy trio present the tale on the big screen back in 2011. Up to that point, I was just something of a country bumpkin, simply enjoying the birds, and making notes in my tattered old field guide as to the birds I had seen. 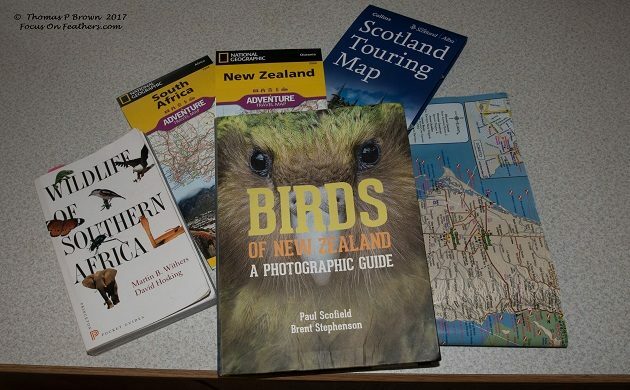 As I have matured, (well, don’t ask my wife about that) I have come to also understand the importance of the recognition that these competitions provide for those non-birders or at least those on the fringe. The upcoming year, 2018, will mark 47 years that I can say I have been actively watching, recording and photographing birds. Thru most of that time, my travels have been pretty limited, staying for the most part in the Pacific Northwest part of the US. The scribbles in my field guide increased with each new bird, with a date, and sometimes a small cryptic note about the bird seen. It never occurred to me to add them all up. Now, all of that is about to change. Starting January, 2018 I am going to embark on what I am referring to as my “Little Big Year”. This will under no circumstances be the daunting undertaking that Noah Strycker, or Arjan Dwarshuis have recently provided the bird world with. In fact, the bulk of my world travels will only cover 5 months, before continuing back into the Pacific Northwest. In addition, I will be joined along the way by my wife, Jeanne and Father-in-law Gordon. Jeanne has done an incredible job of booking all the flights(14), motorhomes(6), rental cars(6) and many places to stay. It will be great to have some company along the way, but I am pretty sure I am not going to be able to refer to Gordon as my “Sherpa”, but I am going to go with that for now. With the family along, there is going to be some obvious non-birding tourist time, side trips that will satisfy the photographer in my wife. April 24th, fly to Melbourne, Australia. And then travel via airplane, motorhome, and rental car to Alice Springs, Sydney, Cairns, Darwin, and Perth. July 20th, fly back to Seattle. At this point things get a bit fluid, as we begin our slow travel back toward the Mexico border. Some talk of Yellowstone Park has come up, definitely work our way down thru Oregon, with Malheur, Summer Lake and Hart Mountain National Refuges all getting some time. Then over to the Oregon Coast for some coastal and off shore birds. After that, it is just a matter of following the migrants as they head to Mexico along with us. I want to send out a huge thanks to Mike and Corey, for allowing me to continue submitting our travels tales as we make this circumnavigation of the earth. I really do not have any expectations, I don’t have a “Number” of species in mind that will serve as a goal, so this trip will serve as a middle ground, between the need for the serene, pure enjoyment of the birds, and my competitive nature, wanting ring up that big number. Well, time will tell, and I do hope you enjoy following along. Wow! This is very exciting! I hope you will have Internet access, Tom, and will be blogging your trip here. Drop in at Kent on the way to London. We have given ourselves ten days to get from Edinburgh to London, just so we can do some “Popping in” so there is a pretty good chance we will do that very thing. I will give you a heads up in advance. Hey guys we are envious! We know you will have a good time, we’ll be missing you, enjoy! What an exciting 2018 you have planned! Don’t worry about the numbers….enjoy the birds! I am sooooo jealous. And there’s no way you’re making your way to the east coast of the U.S.? If you do I bet I can show you some birds! Cool. I look forward to the reports! Come to Germany, Tom. We have Cookies! That sounds like a great trip! Happy birding trails, and all the best. Good luck on your big year I wish you the best! It’s one expensive but I’m sure rewarding endeavour! Thank you very much Miles. I am pretty sure I would like to take you up on that. The e-mail I will be using is focusonfeathers@hotmail.com Drop me a note some time and we can do some scheduling. I really appreciate the offer!